"Stone Walls for the Garden" and "Paving with Brick and Stone" will be offered on Saturday, April 21st at the Berkshire Botanical Garden in Stockbridge, MA. 413-298-3926 or www.berkshirebotanical.org. Rural Life in the Catskills: A Forum on Food, Water and Wood for the Future, Saturday, April 14, 2007 in Andes, NY. Contact the Catskill Center for Conservation and Development, P.O. Box 504, Arkville, NY 845-586-2611. 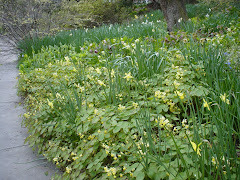 Heronswood Hellebore Spring Open, April 20th and 21st, Burpees Fordhook Farm, Doylestown, PA. $5 admission. Rare opportunity to buy Hellebores from the world's best hellebore nursery. talks about the last one. Picked up some nice hellebores.